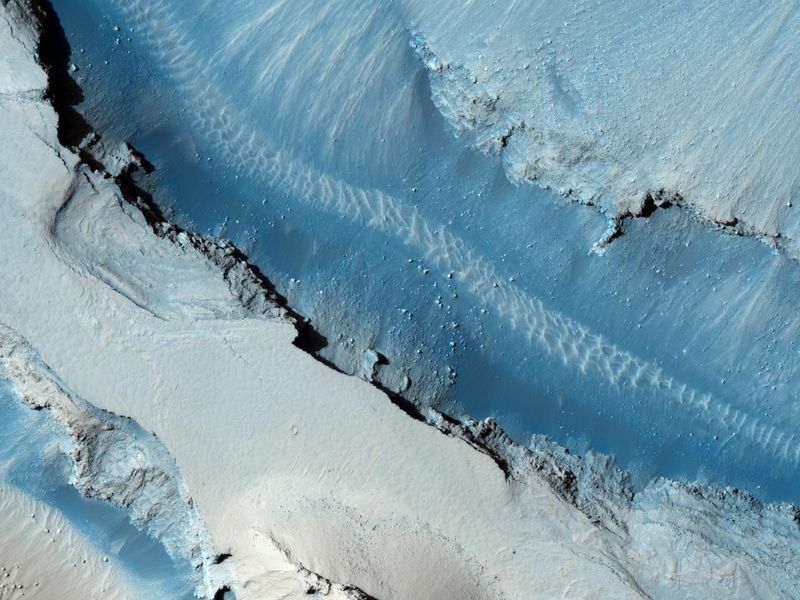 This image shows part of Cerberus Fossae, a long system of extensional (normal) faults arranged in trough-bounding (graben-bounding) pairs. Cerberus Fossae served as the source of a large volcanic eruption that draped Athabasca Valles in lava. 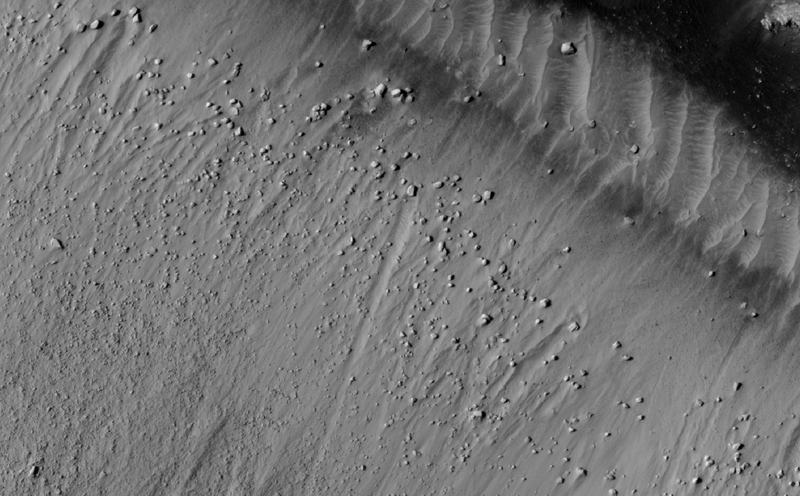 Large boulders that have been dislodged from the graben walls are visible on the floor of Cerberus Fossae. The first subimage shows an example of an approximately 6 meter (20 feet) boulder that left a distinct track as it moved downhill. 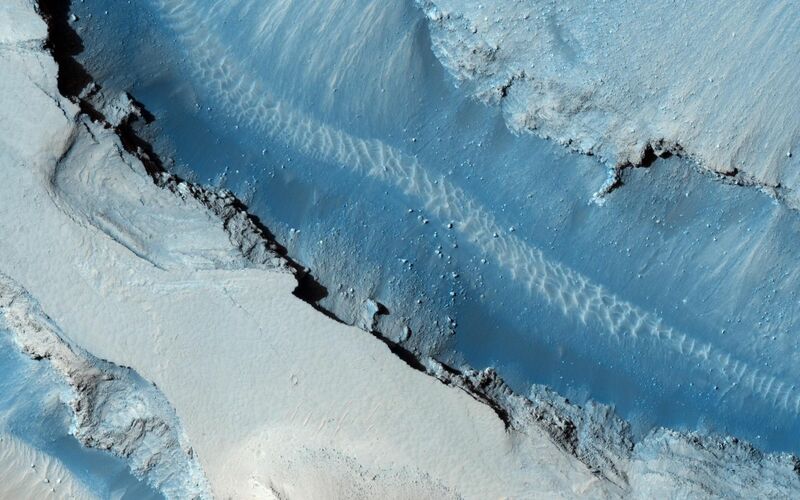 Although this track is quite clear, ripples inside the track are discernible, indicating that enough time has passed for wind activity to rework loose material into the form of ripples. With close examination of this observation, one can see many boulder tracks, some with ripples and some without ripples. 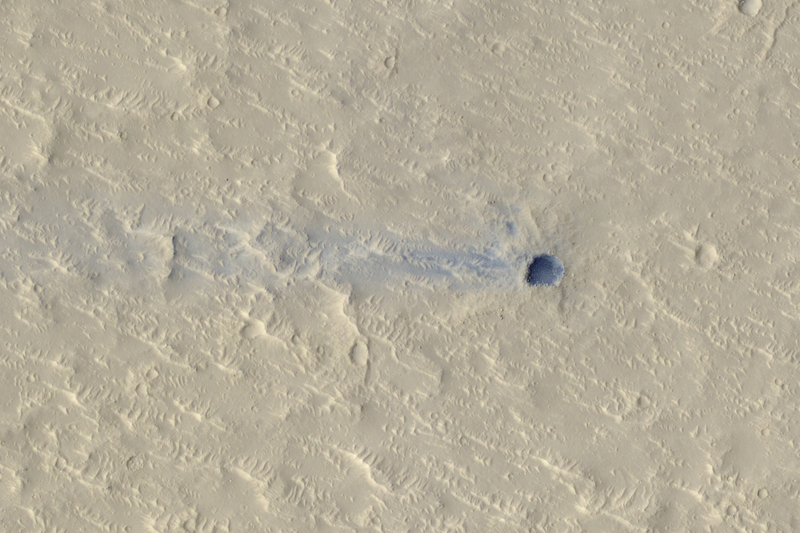 Wind streaks emanating from impact craters are visible on the plains surrounding Cerberus Fossae. The second subimage shows a false color image of an approximately 33 meters (108 feet) impact crater. 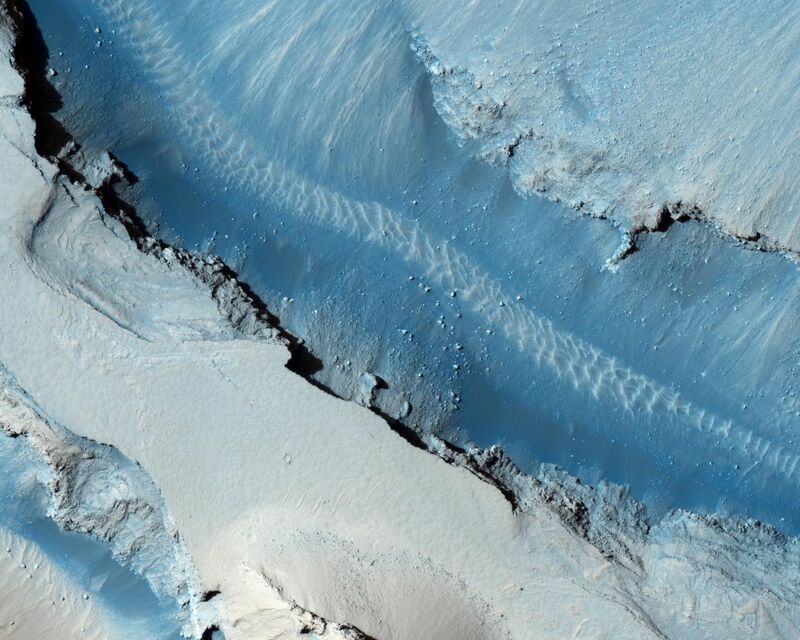 Material on the crater floor (blue in the color image) is being moved by the wind out of the crater and across the plains. The wind streaks in this observation indicate that the predominant wind direction in this region is from East to West. The University of Arizona, Tucson, operates the HiRISE camera, which was built by Ball Aerospace & Technologies Corp., Boulder, Colo. NASA's Jet Propulsion Laboratory, a division of the California Institute of Technology, Pasadena, manages the Mars Reconnaissance Orbiter for the NASA Science Mission Directorate, Washington. Lockheed Martin Space Systems, Denver, is the spacecraft development and integration contractor for the project and built the spacecraft.